The word arts is a noun. Arts means (1) studies intended to provide general knowledge and intellectual skills (rather than occupational or professional skills). The following articles and web pages elaborate on the word arts. The Brooklyn Arts Council in Brooklyn, NY, presents arts events, gives grants, trains artists, teaches students, and provides a directory of arts organizations. Located in New York City, this is the world's premier performing arts center. It is made up of 12 organizations including the Lincoln Center Theater and the New York Public Library for the Performing Arts, which have links on the site. Website lists upcoming events and information for visitors. Art takes many forms and is enjoyed by many people. Find a helpful directory of fine art, photography, design, and other art-related links for all 50 states. 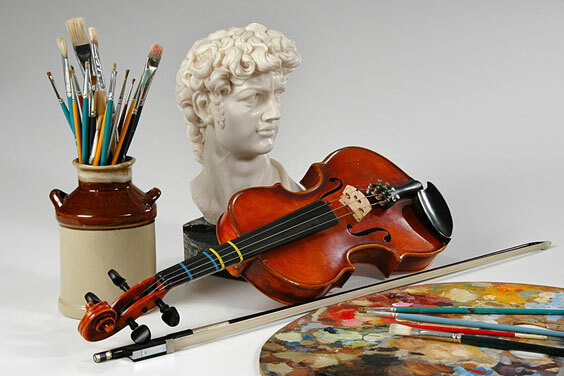 Browse this visual arts directory to find visual arts product and service providers throughout the USA. The photograph on the home page shows colored pencil points. Formerly the American Craft Museum. Located in New York City. Dedicated to collecting and exhibiting objects in clay, glass, wood, metal and fiber. Six non-profit entities that encourage and support arts development and programs on a regional basis. EA was founded in 1982 and is headquartered in Redwood City, California. It is an interactive entertainment software company. The company develops, publishes, and distributes the software worldwide for videogame systems, personal computers, cellular handsets and the internet. EA supports the ratings of the ESRB rating system. The website lists all games and how to download. Provides online art instruction, including a section on drawing. Members can submit work for an online gallery. Also a section on art appreciation and a glossary of art terms. This guide to architecture provides a brief history of the profession and helpful links to selected residential, commercial, and landscape architects. Make is a hybrid magazine/book (a Mook) published quarterly that brings the do-it-yourself mindset to technology. Make is a product of O'Reilly, which also publishes the Hack Book series. The website contains information from the volumes of the Mook--e.g., vol. 11 is all about building alternative vehicles. There are also blogs, podcasts, a store, and projects. Listing of galleries by categories including fine arts, design, decorative arts and antiques, exhibitions, and art fairs and new galleries. Washington University, founded in 1853, is a medium-sized, independent university. There are almost 11,000 students and 3000 faculty. Besides arts and sciences, WU has graduate programs in Business, Design & Visual Arts, Architecture, Engineering, Law, Medicine, and Social Work. The School of Visual Arts is a fine arts and graphic design school in New York City. Starting as a trade school with 3 instructors and 35 students, SVA has grown into a dynamic, multidisciplinary institution with more than 1,000 faculty members and over 4,000 student body members, representing 44 states and 71 foreign countries. For more than 60 years, the College has been an integral part of New York City's cultural life. Source for finding answers to questions of any sort. Provides subject categories that include arts, beauty, pets, best-of questions, and many more. AIGA was founded as the American Institute of Graphic Arts in 1914. Now it represents more than 19,000 designers. AIGA provides five main functions for designers: information, communication, inspiration, validation, and representation. On the website, designers can find out how to join the AIGA and information about competitions, events, publications, and much more. The following articles provide recent arts-related news. ABC News. Wednesday, 24 Apr 2019 13:10:12 -0400. Reuters. Wednesday, 24 Apr 2019 10:46:15 -0400. Voice of America. Tuesday, 23 Apr 2019 10:30:40 -0400. As performers of Shinto theatrical dance age, the Sanriku International Arts festival hopes to encourage youth to help preserve tradition. Japan Times. Sunday, 21 Apr 2019 18:00:39 +0900. Yahoo. Saturday, 20 Apr 2019 20:51:18 -0400. Zacks Equity Research. Zacks. Thursday, 18 Apr 2019 14:10:10 GMT. Rob Dirienzo. Fox News. Wednesday, 17 Apr 2019 20:55:44 GMT. The following digital image illustrates the word arts.